The day started a little later than expected, the cars had to be picked up and packed, the dog had to be dropped off, but we managed to start driving at 10AM. 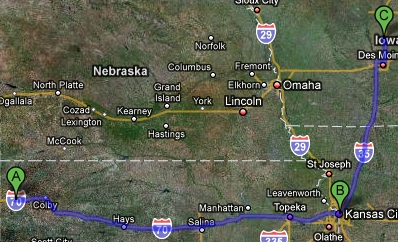 The route went along I35 to Des Moines and from there along I80 West. The drive was rather uneventful, we took a few breaks, had supper in Lexington, NE, and drove to Cheyenne, WY, where we spent the night at The Round Up Motel. We had our breakfast in the the room after Daniela and Lars got the shopping done, and then we left. 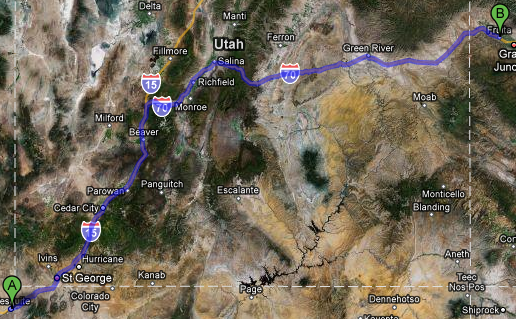 We drove through the rest of Wyoming and into Utah, where we had our dinner in Salt Lake City. After dinner we went to shop for breakfast and lunch for the next couple of days. From Salt Lake City we drove past the Salt Lake all the way to Elko, Nevada, where we stayed at Motel 6. Now it was time to walk instead of driving... We spent the morning on walking around down town San Francisco. Vi saw Cable Cars, Trolley Busses, and Street Cars and a lot more. We decided that it wasn't worth the time to wait in line for the cable car, så we walked around a bit more before we went back to let the children take a nap. After the nap, we piled into the cars and rode around San Francisco. We saw the baseball stadium, Fisherman's Warf, and the marina before heading West towards the Pacific. When we parked at the beach and opened the doors, we could all feel that we had come home. We missed the salty air. Most got their feet wet and the children rolled in the sand. When we had dusted them off, we drove accross the Golden Gate Bridge to Sausalito, where we took a lot of pictures and had our dinner before going back to the hotel. On the way back the bos (all of them) decided that we need to go over just ooone more of the steep hills in San Francisco. It turned out to be "San Franciscos' Crookedest Street." Then we went back to the hotel for a quiet night. We didn't get out as early as we had hoped, but we got everything stuffed into the cars, which we then left at the hotel parking ramp. The trip to the pier was by street car. Not very many cities still have street cars, so in San Francisco they have collected as many as possible and painted in the colors used in the cities that used to have them. It was a nice trip, and we got off at the pier where the boat to Alcatraz docks. We had some time to spare, but not enough to visit the Aquarium like we had hoped. Oh, well, we spent the time browsing around on Pier39, among other things, we found fresh cherries, which we ate as an early lunch. The trip to Alcatraz was very exciting. Lars had been there before, but it was new for everybody else. It was interesting to see where they finally locked Al Capone up, and the island history as a military fort, military jail, federal jail, indian rebel base, and finaly museum was definitely worth it. When we returned to the city, we had a late lunch on Pier39, before taking the street car back to the hotel to get the cars. 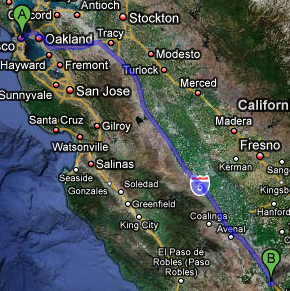 We took I580 East, where we stopped in Livermore to shop a little. Ironically Lars had been to Livermore only two months earlier for work, so he knew exactly where to find a grocery store. The rest of the day we drove south on I5, where we found a hotel in Lost Hills, where we had to turn off the Interstate anyway. We moved on from Lost Hills today. The route took us through part of the Californian agricultural region, and we stopped right where it ended to buy fresh fruit.Then we drove up to the Mojave desert, where we saw a whole lot of not very much. When it was close to lunch time, we asked the GPS to find us a park, so it did. We had lunch in the Jasper Park in Barstow. It went OK, but half wasy though, we realized that it might not have been the best place to stop. The neighborhood certainly looked rough. Oh, well. 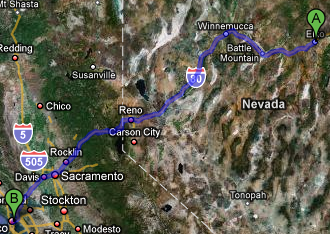 We had our lunch and continued along Interstate 15. Early afternoon we entered Nevada, which was full of... nothing. Later in the afternoon we got to the suburbs of Las Vegas, where we turned off the Interstate to head for the Hoover Dam. Lars had been there before, so he was quite surprised to see that they are building a new bridge accross the canyon. Will, we got there too late to visit the museum, and the parking ramp was closed, så we crossed the dam and parked on the Arizona side. The we spent about an hour walking on the dam and taking i everything. When we continued, we decided that we wanted to see "The Strip", also called Las Vegas Boulevard, where all the big casinos are located. It was a bad idea. It was supposed to take about 15 minutes, but because of traffic it took an hour. We did get a chance to see the Luxor, New York New York, Excalibur, and the other casinos and the light shows. We continued along I15 and stopped for the night just before the Arizona border in Mesquite. Thursday was a shorter trip. We drove up I15 to I70. Then it was lunch time, so we stopped in the middle of Utah at something that looked like a rest stop... It wasn't! It was an old fort that is run as a museum/mission by the Mormonerne today. Well, at least they had clean rest rooms. We ate our lunch and went to have a look at the fort. It had an interesting history, ad was fun to look at, so we endured the missioning as long as we could. We politely turned down a copy of the Book of Mormon in Danish and hurried along. The rest of Utah was full of... nothing. We crossed into Colorado late afternoon and drove to Fruita to find a motel. It turned our to not be that easy, so we ended up having to take a suite. The hotel had a pool, so it helped a little. After an hour in the pool, we found a place to eat, where we almost certainly made the owner wish that he had managed to lock the door 5 minutes earlier, but it was good food, so we didn't care. We stopped early yesterday because we wanted to visit a Dinosaur dig right on the border between Utah and Colorado, so we went there right after breakfast. The dig was active with a group of visitors from the museum on Fruita, so we got a chance to see them uncover a bone. Next to the dig was the Rabbit Valley Trail Through Time, which is a path through the area, where they have exposed several fossil skeletons. We also saw live lizards. Fromt Rabbit Valley we followed the Colorado River up through the Rocky Mountains. At the highest point we were 11,000 feet above sea level, and at the same level as the last snow in the mountains. It was a beautiful drive, and we really enjoyed it. The Rocku Moutains turned into Denver, which we drove through and found a supermarket on the other side to stock up and have dinner. The rest of the evening we drove East, where we found a motel in Goodland just on the other side of the Kansas border. The last day! We drove through Kansas, which is full of... othing. At least nothing in Kansas is green! Late afternoon we arrived in Kansas City, where we visited Darcy and Curt, whom we met through Skype. We had dinner, and later cousin Anders, whom we haven't seen in 10 years, turned up. Anders lives in Kansas City too, so it was good to see him and get to know Michelle, and we agreed that we have to meet again. Around 10 we left and headed for Ames, where we arrived shortly after 1AM.